Jeff Morrow, Barbara Lawrence, John Emery et al. A alien satellite enters close orbit around the Earth and releases a projectile that takes over the body and mind of Dr. Hubbell Eliot (John Emery), the director of Lab Central, America's top astrophysics research facility. Even as Elliot is falling victim to the invaders, Lab Central scientist Dr. Leslie Gaskell (Jeff Morrow) and his colleagues, Vera Hunter (Barbara Lawrence) and Dr. Arnie Culver (George O'Hanlon), have begun tracking the object - not certain what it is - and determine that it is going to hit the Earth in less than 24 hours. An attempt to destroy it with nuclear warheads fails, and the vehicle comes down off the coast of Mexico. While Eliot tries to resist the invaders' control and is hospitalized in a state of collapse, Gaskell, Vera, and Culver fly to the site of the landing, where the submerged craft emits a powerful energy pulse that spreads across the surface of the ocean and toward the beach. When it clears, there stands on the beach a huge metallic object -- a towering robot, inadvertently christened "Kronos" by Gaskell, in a relative moment of whimsy. Hundreds of feet tall and possessing immense power, Kronos proceeds to rampage across the countryside, destroying everything in its path as it seeks out and absorbs all sources of electrical and atomic energy. Back at Lab Central, Eliot temporarily breaks free of the aliens' control, long enough to tell Gaskell of the robot's purpose and mission - Kronos is a accumulator, sent to Earth by a race whose own planet is depleted of energy, and it will continue to grow stronger unless someone can find a way of reversing the process; worse yet, if Kronos isn't destroyed, other accumulators will be sent to drain the Earth of all its energy. The robot advances relentlessly, growing in destructive power as it moves up the coast, and not even a hydrogen bomb can slow it down. 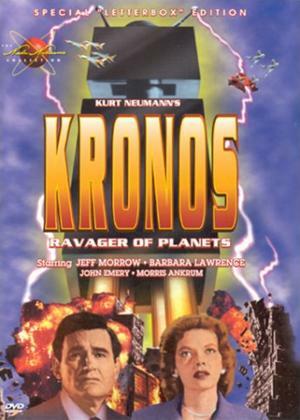 Finally, as it heads toward an H-bomb depository and prepares to destroy the city of Los Angeles in its path, Gaskell devises a possible method of stopping Kronos, based on an untested, untried scientific theory.